The Bowdoin College Museum of Art will be showing the 2013 film Dorothy and Herb, 50X50 at 4:30 p.m. on Thursday, September 4, in Kresge Auditorium, Visual Arts Center. Following the film, famed art collector Dorothy Vogel, featured in the film together with her husband Herb, and Megumi Sasaki, producer and director of the film, will engage in a public question and answer discussion. The audience is invited to a reception at the Museum of Art immediately after the screening to meet and speak with Dorothy Vogel and Megumi Sasaki and to view the exhibition of a selection of works given to the Bowdoin College Museum of Art by Herb and Dorothy Vogel. The film and reception are open to the public. Developed as the follow-up film to Megumi Sasaki’s award-winning documentary Herb & Dorothy (2008) that moved millions of art-lovers worldwide, Herb & Dorothy 50X50 captures the last chapter of the Vogel’s extraordinary life and their gift to the nation, raising various questions on art, and what it takes to support art in today’s society. A ‘road movie’ through the art world, the film takes the audience on a journey across the US to eleven recipient museums, from Honolulu to Fargo, meeting curators and visitors, and introduces famous (often controversial) artists, as well as unknown favorites of Herb and Dorothy. Continue reading Herb & Dorothy 50X50 at Bowdoin College Museum of Art on Sept. 4. Baltimore, MD (August 27, 2014)—The 34th Annual Baltimore Summer Antiques Show attracted robust crowds of knowledgeable collectors and respected dealers from around the world who came to purchase from the extensive array of merchandise offered by more than 500 prominent exhibitors, many of which are the world’s foremost experts in their respective fields. Over the Show’s two day set-up and four-day tenure (August 21-24, 2014) the Baltimore Convention Center welcomed more than 35,000 collectors of all ages, cultures, educational and professional backgrounds. Scott Diament, managing partner of the Baltimore Summer Antiques Show and President/CEO of the Palm Beach Show Group commented, “The extraordinary collections showcased at the Baltimore Summer Antiques Show cannot be found anywhere else, so this makes our show the ideal opportunity for people to view and purchase some of the most amazing things in the world." Continue reading Miro Color Etchings Among Top Sales at Baltimore Summer Antiques Show. DALLAS—A pair of rare, pre-production concept paintings from the 1939 MGM classic The Wizard of Oz—used to craft two of the movie’s most beloved scenes—sold for a combined $45,625 in Heritage Auction’s $1.2+ million Entertainment & Music Memorabilia Signature® Auction in Beverly Hills. The 600-lot auction also featured a Lansky Bros. leather coat worn and owned by Elvis Presley, which sold for $35,000—more than eight times its estimate. Continue reading Wizard of Oz Production Concept Paintings Bring $45,625 at Heritage Auctions. Doyle New York is honored to auction important World War II tribute albums presented to American Staff Sergeant Lawrence R. Kelly. On August 25, 1944, Kelly was mistakenly wounded by a French sharpshooter on the first day of the liberation of Paris. The album was conceived by the Saint-Cloud pharmacist who treated Kelly’s wounds. This stunning tribute to one man who became a symbol of a grateful nation will be auctioned in Doyle New York’s November 24, 2014 sale of Rare Books, Autographs & Maps. Offered together with the Purple Heart medal awarded to Kelly, the album is estimated to sell for $12,000-18,000. Lawrence Russell Kelly was born and died in Altoona, Pennsylvania. In 1917 at the tender age of 15, Kelly lied about his age and fought for eight months during World War I in France, where he was wounded twice. Continue reading Doyle NY to Auction Important WWII Tribute Albums. New York, NY, August 25, 2014—Cy Twombly‘s Treatise on the Veil (Second Version) is considered a pivotal work in the career of one of the most important artists to emerge in the wake of Abstract Expressionism. Yet, due to its size—close to thirty-three feet in length—this highlight of his celebrated “grey-ground” period is rarely shown and has not been exhibited in New York in nearly thirty years. Beginning September 26, Treatise on the Veil and a selection of related drawings will go on view at the Morgan Library & Museum, in a collaboration with Houston’s Menil Collection, which owns the works and organized the exhibition. The show will run through January 25, 2015. Executed in Rome in 1970, Treatise on the Veil (Second Version) was inspired by a musical composition and explores Twombly’s fascination with time, space, and movement. White lines running across the work’s grey surface suggest, in the artist’s words, “a time line without time.” The twelve drawings in the exhibition—which combine pencil, crayon, collage, tape, measurements, and other inscriptions—offer an intriguing window into the artist's creative process. Treatise on the Veil (Second Version) was last exhibited in New York in 1985 at DIA. Continue reading Cy Twombly’s “Treatise On The Veil (Second Version)” Will Go on View at the Morgan Library. 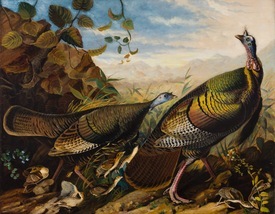 BENTONVILLE, Ark.—Crystal Bridges Museum of American Art announces the John James Audubon and the Artist as Naturalist exhibition, September 27, 2014 - January 5, 2015, on view within the museum’s Colonial to Early 19th-century Art Gallery. In his famous publication The Birds of America (1827-1838), American naturalist and artist John James Audubon depicts over 400 species of North American birds with his life-size prints. The exhibition will feature Crystal Bridges’ double elephant folio copy of The Birds of America, re-issued by Audubon’s son in 1861, and will highlight several artworks related to the renowned publication. Continue reading John James Audubon and the Artist as Naturalist at Crystal Bridges. NEW YORK— Coming on the heels of tremendous media coverage, including write ups in The Telegraph, The Daily Mail, Luxury Travel Magazine, Robb Report and Slate, Swann Galleries’ August 6 auction of Vintage Posters grossed more than any previous August posters sale, bringing in more than $800,000. Among the top lots were highlights from a collection of tennis posters, which was larger and more important than any tennis poster collection to appear at auction before, World War I & II images, scarce Buffalo Bill posters, Geo Ham’s Grand Prix advertisements and summer and beach resort promos by celebrated artists. Continue reading Vintage Posters Brought in $800,000+ at Swann Galleries. Berkeley, CA—Digital is dead, at least for one week this coming February. Over 200 of the world’s most distinguished book artists and artisans, private presses, and fine art publishers will be exhibiting their work at the upcoming biennial CODEX International Book Fair, February 8 through 11 at the Craneway Pavilion in Richmond, California. THIS IS THE LARGEST BOOK FAIR OF ITS KIND IN THE WORLD TODAY! Continue reading Announcing Codex V Book Fair & Symposium, February 8-11, 2015. (Boston, MA)— The Massachusetts Cultural Council (MCC) Board voted unanimously today to approve the designation of the Boston Literary Cultural District. This is Boston’s second state-designated cultural district—the Fenway Cultural District was designated in 2012—and the first Massachusetts Cultural District to focus specifically on one art form. The effort to establish the district was led by GrubStreet Founder and Executive Director Eve Bridburg. GrubStreet’s headquarters are located in the district which runs from Copley Square to Downtown Boston and is also home to the Boston Athenaeum, Boston Public Library, and the annual Boston Book Festival. Continue reading Boston Approves Nation’s First Literary Cultural District. NEW YORK, August 19, 2014—In an unprecedented move, six renowned auction houses have joined forces to launch Bidsquare, a new online bidding platform. Bidsquare will provide access to a huge variety of top property from the country’s leading auctions on an intuitive, easy-to-use website and—for the first time ever—allow collectors and auction houses to do business directly in an online forum. The site, created by Brunk Auctions, Cowan’s Auctions, Leslie Hindman Auctioneers, Pook & Pook, Inc., Rago and Skinner, Inc., is a bidding platform where like-minded competitors are coming together for the good of buyers, sellers and auction houses alike. It is backed by the reputations of these prominent establishments and their well-respected specialists. What’s more, Bidsquare delivers a vast array of exceptional property, from fine art to estate jewelry and from high design to historical artifacts, all vetted by America’s foremost auction houses, much of it unavailable elsewhere. The easy-to-use site also boasts a free, searchable database of over 600,000 auction records—and counting. Continue reading Bidsquare, the First Online Bidding Platform Created for Collectors by America’s Leading Auction Houses. Boston, MA, August 19, 2014—“Over Here: World War I Posters from Around the World,” on view at the Boston Athenæum September 10, 2014 through January 31, 2015, is timed to coincide with centennial observances of World War I in Europe and the United States. The exhibition features 44 framed posters from Great Britain, France, Germany, the United States, Canada, Ireland, and other nations as well as cases with leaflets, maps, magazines, postcards, and a recently acquired, printed French handkerchief given to American soldiers serving in France. The selection presents striking but rarely seen images from one of the most critical moments in world history. The works are drawn from several important World War I collections now in the Athenæum, started during the war by Boston collectors who were as young as ten. Continue reading Exhibit of WWI Posters Opens at the Boston Athenaeum on Sept. 10. Bloomsbury Auctions’ London two day Summer Book Sale will appeal to all collecting interests. Day one features a rare first collected edition of Hans Christian Andersen's 'Fairy Tales' and an impressive collection of important Incunabula, including work by Aristotle. Day two has a different appeal as all lots will be offered without reserve. Hans Christian Andersen's Eventyr foralte for børn, or ‘Fairy Tales told for children’, was originally issued in Danish as three small, separate pamphlets between 1835 & 1837 before in 1837 being combined as a collected edition. Unlike most copies to have appeared on the market, this copy comprises the first printing of each part. Continue reading First Collected Edition of Andersen’s Fairy Tales Headlines Bloomsbury’s Summer Book Sale. This catalog features rare, antique and decorative books as well as select additions of ephemera and artwork. The artwork is led by an original painting credited to Rufino Tamayo and a group of Picasso items, including original signatures by the artist. Highlighted is a fine private collection of early and first printings of Nancy Drew titles in the original dustjackets and an assortment of vintage and antique magazines, including Civil War year issues. Continue reading Early Printed Books, Rufino Painting at National Book Auctions. The earliest manuscript reference to the New World is the centerpiece of a facsimile edition published by Levenger Press in association with the Library of Congress. "Christopher Columbus Book of Privileges: The Claiming of a New World" contains the first authorized facsimile of the Library’s copy of the royal charters, writs, grants and papal letters that comprise Columbus’s "Book of Privileges." An assemblage of legal documents between King Ferdinand and Queen Isabella of Spain and Christopher Columbus, the "Book of Privileges" laid the foundation for the exploration and conquest of the New World, irrevocably changing the course of the Americas’ history. Continue reading Facsimile Edition of Columbus’s “Book of Privileges” Is Published. The Stanley Gibbons Group plc announces the appointment of George Bailey as Chairman of Dreweatts & Bloomsbury Auctions, the art and antiques auctions subsidiary of The Stanley Gibbons Group plc with effect from 1 September 2014. With over 35 years’ experience in the fine art and auction industry, George is best known for his career at Sotheby’s as a key member of the firm’s European management team and as an exceptional auctioneer. Continue reading George Bailey Appointed as Chairman of Dreweatts & Bloomsbury Auctions. Philadelphia, Pennsylvania—August 13, 2014—This summer the Library Company is hosting two exquisite exhibitions of book art. Teresa Jaynes's new work The Moon Reader will be on display from September 4 to October 10; "Small Wonders" a collection of whimsical miniature books created by the members of the Delaware Valley Chapter of the Guild of Book Workers is on exhibit through September. The Visual Culture Program (VCP at LCP) will host an installation of the first new work by Teresa Jaynes since her directorship of the acclaimed print festival Philagrafika 2010. The Moon Reader, created with the assistance of Katherine Allen, is a multimedia installation that invites participants to learn to read Moon, a raised-letter writing system for the blind invented by blind educator William Moon in 1845. Continue reading Book Art and Miniatures at the Library Company. BOSTON, MA—The annual fall gathering for booklovers, the Boston International Antiquarian Book Fair, will return to the Hynes Convention Center in Boston’s beautiful Back Bay, November 14-16, 2014. A record-breaking 130 dealers from the United States, England, Canada, Germany, France, Hungary, Italy, Russia and The Netherlands will exhibit and sell rare, collectible and antiquarian books, illuminated manuscripts, autographs, maps, atlases, modern first editions, photographs, and fine and decorative prints. There will be 15 first-time dealers and 25 international dealers at this year’s show, bringing a wide and diverse selection of items of interest to the serious collector or the curious browser. Seminars and events punctuate the weekend, including talks by the Massachusetts Historical Society’s Peter Drummey and Fruitlands Museum’s Michael Volmar, as well as The Annual Ticknor Society Roundtable, a panel discussion of collectors talking about their collections. More events will be announced, and folks can visit www.bostonbookfair.com for up to the minute details. Continue reading 38th Boston International Antiquarian Book Fair Returns Nov. 14-16. Amherst, MA (August 11, 2014)—The Eric Carle Museum of Picture Book Art is proud to present Madeline at 75: The Art of Ludwig Bemelmans, on view from November 15 through February 22, 2015 in Amherst. The exhibition, which celebrates the 75th anniversary of the publication of the classic Madeline, honors the plucky schoolgirl in Paris and her creator with more than 90 rarely seen works. Madeline at 75 was organized by The Carle and curated by Jane Bayard Curley. It premiered at the New-York Historical Society in July, where it will remain on view through October 19. This is the first exhibition devoted to Bemelmans in more than 50 years. Continue reading Celebrate the 75th Anniversary of Madeline at the Eric Carle Museum. Hidden treasure from the home of the nation’s much-loved author, Agatha Christie, comes to light at the Bonhams, Knightsbridge Jewellery auction on 8th October. Amongst the trees that line the banks of the sparkling Dart estuary, stands Greenway, the handsome Devon home of Agatha Christie. Even after the murder-mystery writer has long departed, her house continues to reveal secrets of its own. Continue reading Agatha Christie’s Jewels Found in Old Suitcase, Now Offered at Bonhams. BOSTON, MA—(August 8, 2014) A very early original preliminary production cel featuring Snow White from Snow White and the Seven Dwarfs, will be featured in an upcoming auction devoted entirely to Animation Art later this month, by Massachusetts-based RR Auction. The Snow White cel was created circa 1935, shows the character wearing a long pink dress with a blue bow in her hair. This rarity is on a full animation cel, complete with peg holes and a cel number at the bottom right, not to be mistaken for a color model. The image measures 2.25 x 5, with overall dimensions of 12.25 x 9.75. Continue reading Early Snow White Production Cel Up for Auction. The Library of Congress has acquired the American Ballet Theatre’s vast archives and will open a celebratory exhibition about the dance company on Aug. 14. "American Ballet Theatre: Touring the Globe for 75 Years" will be displayed in the foyer of the Performing Arts Reading Room in the Library’s James Madison Memorial Building, 101 Independence Ave. S.E., Washington, D.C. The exhibit is free and open to the public from 8:30 a.m. to 5 p.m., Monday through Saturday, starting Thursday, Aug. 14. Also starting Aug. 14, the exhibit can be viewed online at www.loc.gov/exhibits/. Continue reading Library of Congress Acquires American Ballet Theatre Archives. NEW YORK, NY, August 4, 2014—The New-York Historical Society is pleased to announce it will display an important, recently discovered handwritten document that sheds new light on the period leading up to the Declaration of Independence and the final break with Great Britain. The manuscript was discovered last summer in the Morris-Jumel Mansion in New York City, which served as George Washington’s headquarters during the Revolutionary War, and was recently acquired by Brian Hendelson, a noted New Jersey-based Americana collector. Hitherto unknown and unstudied, the manuscript will be on view at New-York Historical in the Patricia D. Klingenstein Library from August 5 through November 7, 2014 and will remain on loan to New-York Historical for purposes of study and display for two years. Continue reading Rare Independence Document on View at the N-YHS for the First Time. BRUNSWICK, Maine, August 4, 2014—Two life-size bronze statues on the campus of Bowdoin College that have withstood the weather and elements of Maine for 120 years will be rejuvenated beginning this week. Crafted by renowned Neapolitan bronze caster Sabatino de Angelis, the 19th century sculptures of the Ancient Greek playwright Sophocles and the Ancient Greek orator Demosthenes are original to the 1894 Beaux Arts Walker Art Building, home to the Bowdoin College Museum of Art (BCMA). Noted architect Charles Follen McKim of McKim, Mead & White, designed the building, which underwent a $20.8 million award-winning renovation and restoration in 2007. Continue reading Bowdoin’s 19th-C. Bronze Statues of Demosthenes and Sophocles to Undergo Conservation. San Francisco—Bonhams, the third largest international fine art auction house, will begin its fall season with an auction of fine books and manuscripts on September 22 in San Francisco. The sale will be simulcast in New York and will preview there from September 12-14, as well as in San Francisco from September 19-21. The autumn sale will feature one of 425 paper copies of “The Works of Geoffrey Chaucer,” as printed by William Morris’ Kelmscott Press in 1896 (est. $30,000-50,000). The work features 87 woodcut illustrations designed by Pre-Raphaelite British artist Edward Burne-Jones (1833-1898). Continue reading Edward Burne-Jones’ Kelmscott Chaucer and Book of Hours From His Personal Collection Up for Auction. DALLAS—A scarce original one sheet poster for the 1925 horror classic The Phantom of the Opera—formerly from actor Nicolas Cage’s collection and one of four known to exist—sold for $203,150 in Heritage Auctions’ Vintage Movie Posters Signature® Auction July 19-20 in Dallas. The $2.3+ million auction saw strong interest in pre-War movie posters as a rare Charlie Chaplin six sheet for Sunnyside, from 1919, sold for $71,700. Continue reading The Phantom of the Opera Movie Poster Brings $203,150 at Heritage Auctions. SAN MARINO, Calif.— The Huntington Library, Art Collections, and Botanical Gardens announced today that it has acquired one of the most historically and artistically important Chinese illustrated books ever published. The book, a set of early color woodblock prints known as The Ten Bamboo Studio Collection of Calligraphy and Pictures, was published in 1633 by Hu Zhengyan (1584-1674). Hu, a noted publisher, calligrapher, and seal-carver, named the book after his Ten Bamboo Studio in Nanjing, where he and his friends would gather. 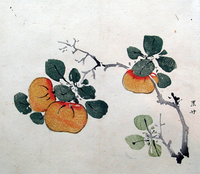 The book is understood to be among the earliest existing examples of color woodblock printing in China, produced as a work of art but also as a manual to demonstrate painting techniques and different ways of presenting elements in nature. Continue reading Huntington Acquires Rare Book of 17th-C. Chinese Woodblock Prints. On view August 20 through October 6, 2014, in the Harnett Museum of Art, is the exhibition Tanja Softić: Migrant Universe. Softić’s prints, drawings, and paintings combine images of natural and man-made structures with drawings based on appropriated visual material: medical and botanical illustrations, maps and charts, manuscript illuminations, and comic art. Her work addresses concepts of cultural hybridity, chaos, and memory. Her series, Migrant Universe, created from 2007 to 2011, consists of ten large mixed media works and is a “visual poem” about identity and the worldview of the immigrant. Continue reading Three Prints Exhibits at the University of Richmond Museums.